Day 6: Viterbo-Terracina, 113 miles We can see the sea!!!!! Yesterday we hit 600 miles, made it past the half way stage, got through Rome and arrived at the coast. It was a long day in the saddle. We started at 0730 and arrived at our accommodation at 7pm. Today is a much needed rest day to give our knees, brains and bodies a break so we can feel recharged and full of happy spirits before we continue south on Saturday. In addition to hitting the milestones I've just mentioned, we also managed our slowest chunk yet. It took us 42 minutes to cover the first five miles as we climbed out of Viterbo. At one point my speedo read 2.4mph and Rich's Garmin kept on auto-pausing, even though he was still moving forwards! But once again we were rewarded with more incredible scenery. This time a pine forest, with the calm and inviting Lago de Vico to our left. The views and sounds changed again soon after when we hugged the hard shoulder of a busy road into Rome. It wasn't the most pleasant of experiences but we had lights on, cars and trucks were respectful and there were no signs saying 'bikes not allowed'. It was just plain sh*t scary and noisy and a case of keep your wits about you and keep pedalling. By 1000 we were very much on the outskirts of Rome and stopped for a break. We didn't want a repeat of Wednesday when we didn't eat enough, so munched through banana, cherries and pizza. We had carefully planned our route through Rome and out the other side. 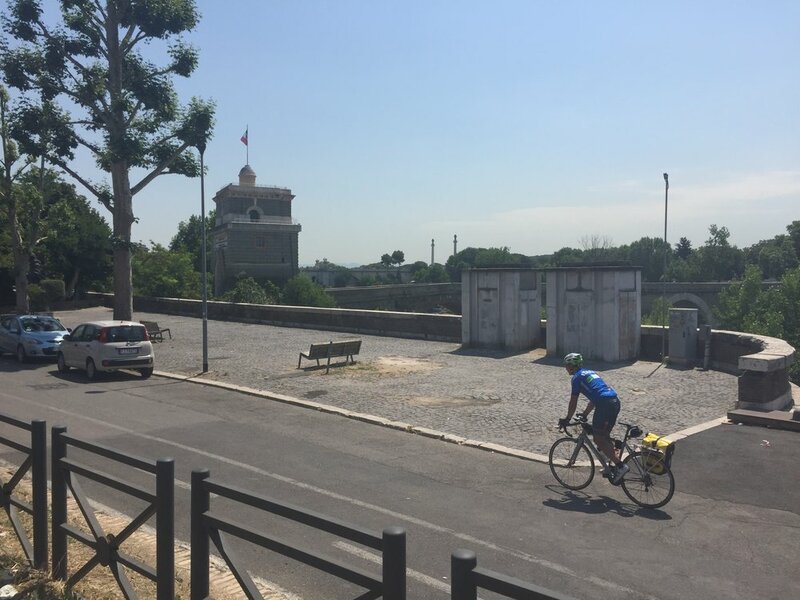 Rich worked his magic with the Garmin and before we knew it we had made it to the River Tiber. From there we followed cycle paths through the city until we reached the Via Appia Antica- the old Roman road. By this time it was around 1230 but we decided to grab some food while we could. I am so glad we did, because the Romans didn't leave any shops along Via Appia Antica. But it seemed so fitting to ride out of Rome on an ancient road. It was hard work because it is still made of cobbles, very long and very straight. Concentration overload! It took forever... a runner made faster progress than we did, as we broke the morning's 5 mile record, taking 43 minutes! We finally left the cobbles and Roman ruins behind and joined civilisation again by the airport, from where we headed east and faced the mother of all climbs to get up and out of Rome. It nearly broke me! We saw 36 degrees on a thermometer by the roadside. But the view down over Lago Albano, an extinct volcano, was something else. By 4pm we still had 50 miles to go. Rich wisely spotted a gelataria so we did what two hot cyclists should do. Yum! At this point I thought we would arrive at Terracina at around 7.30-8pm. But we made good progress and pretty much did a slow but steady 2-up TT all of the way along the flat, smooth and fast road to the coast. 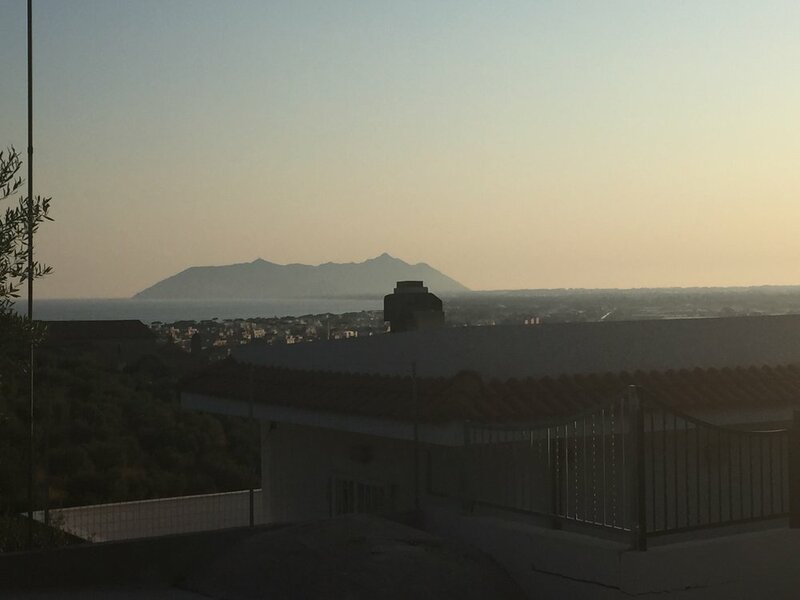 We arrived on the outskirts on Terracina at 6.45pm, dripping and broken. Then of course we kept with tradition and faced an uphill climb to our accommodation. But we were treated to a beautiful sunset! Breakfast of kiwi fruit, yogurt, three slices of cracker bread, coffee. Mid morning: slice of pizza, espresso, banana, handful cherries. 1 cereal bar. Lunch: cheese, ham and tomato sandwich. Mid-afternoon: 2 cereal bars. 4pm: gelato stop! 6pm: "Rich I can't keep up, I need a lunch box Soreen again!" 55 minutes: the time we spent riding over cobbles to get out of Rome. 2,186m: the height climbed in the first 63 miles. It must have broken the elevation tool as it didn't record much after that. 55km: the length of straight smooth road which led to the coast. 1: puncture!!! The first one of the trip. 8hrs 51 minutes: riding time. Yes I can feel it. Everywhere.